Today is Sunday, September 9, 2012. On August 15, the Mikdad clan started an abduction of Syrian and Turkish Nationals. Between August 15 and September 7, the army and ISF didn’t do anything to free the hostages. They knew -Everyone did as they appeared in live press conferences- who were the kidnappers, what was their manpower, where they met, at what hour, what they thought, what they planned. But no one did anything.The president, his prime minister, and his government made no more than statements condemning the kidnappings. The army on the other hand was busy trying to sue an MP that criticized her instead of taking care of a wave of kidnapping and sectarian clashes that would’ve erupted in a civil war. 25 Days of nothing. Suddenly, the awakening. 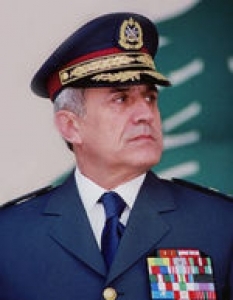 The army remembers that there are abducted people in the custody of a Lebanese clan, and decides to storm house, make some arrests, and try to free the hostages. The meeting was behind closed doors but it “wasn’t a secret.” Apparently, the discussions between the Syrian prime minister, Foreign minister and Suleiman were about the Samaha case. The Samaha plot frustrated the President. It was obvious, his speeches and statements in the last few weeks were all requesting explanations from the Syrian officials. They gave him explanations and clarified the everything in the Tehran meeting, he said. The Syrian officials can’t afford having the Lebanese President as an opponent in this particular time. And explanations didn’t come alone. There was apparently a gift with it. Giving up on their new minor allies in the other side of the border, the Mikdads. Can there be another explanation to this phenomena? Hard. Why did the army move now? Why not 25 days ago? Why after the Tehran meeting? Why did none of the pro-Syrian political parties publicly stood (until now) by the Mikdads while they were being arrested? The president Michel Sleiman wants to show that his country isn’t out of his control after the wave of kidnappings, the Samaha plot, and the Tripoli clashes. The Syrians need the president on their side. And the Mikdad military wing is clearly a pain in the neck for everyone in this equation. Posted in Lebanese Politics, Michel Sleiman, Mikdad, Politics on September 9, 2012 by Ramez Dagher.